Well I am at it again to answer a real and important question. 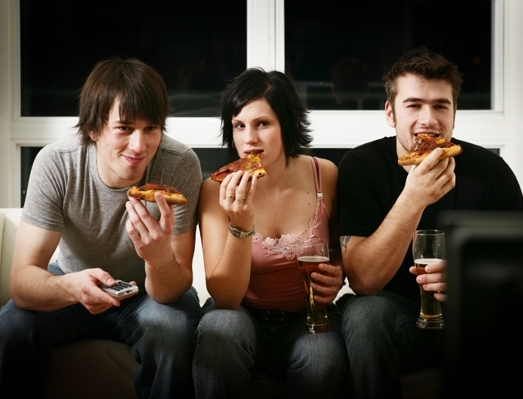 Does TV watching really make you fat? It turns out that there is a direct correlation between body fat and TV watching. As you might guess there are also less direct correlations with diabetes and other illnesses. Still since we have the choice to hit the “off” button, we can’t really blame the TV. What can be said for those of you who like conspiracy theories is that the “powers that be” are hard at work figuring out how to manipulate human behavior. Examples include increased “food and eating” programming among commercials during peak TV hours. And on a more sinister note, a huge (at least 50% increases) in what most of us would call junk food-based commercials aimed directly at young children. There has also been a big increase in the general programming aimed at young children. Now if this sounds like “tobacco company” type behavior it really does begin to sound conspiratorial doesn’t it! The arguments against this from Big Food are that you need food to live and you don’t need cigarettes. Other interesting fact associated with the weight gain we see with increased TV watching is related to energy expenditure. It is true that people who watch more TV do less. Their energy expenditures on a daily basis are lower, meaning they don’t make up for the time sitting on their arses with exercise. But believe it or not that does not seem to be the real reason they are fatter. It appears the real reason is they eat more while watching TV. So I will leave the conclusions about programming people’s minds and behavior to you. Those are the facts; you can do what you want with them. I wonder what would happen if every major news channel aired positive news about the economy for the next 3 weeks? Ok now to the most important part: what can you do about it! 1) As I have said before, TV is pretty much the enemy of health in my mind but you can do something healthy like ride an exercise bike while you watch if you must watch. 2) Learn the location and the action of the “off” button. 3) Be aware of programming that “suggests” that you need to eat something or drink something, especially if you have young children. 4) If you have serious problems with appetite I have a whole product line that is very very effective at helping people take control of their appetites, get rid of their sweet tooth, end their compulsive eating even while watching TV and of course helps them morph their bodies into something healthier and happier. If you are unsure of which one to use, check out our weight loss product guide. You are the master of your fate and the captain of your ship, not the TV!!! P.S. Want to know how many inches you’ll loose for each pound? Set goals, and stick with them! How To Increase Your Calorie Burn By Twenty Percent Teen Obesity – Rosie Is Not A Fat Slob!